Description: When the arrogant prince of the asgardians nearly starts a war with Jotunheim, Odin strips him of his powers and sends him and the magical hammer Mjolnir to Earth as penance. 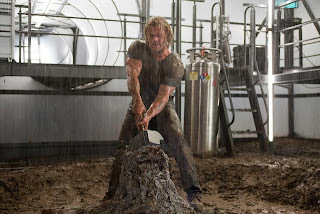 Whosoever holds this hammer, if he be worthy, shall possess the power of THOR. 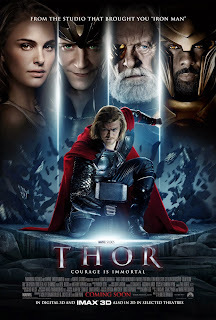 Based on the Marvel comics interpretation of Norse mythology, Thor brings us a tale of a man who has to learn from the consequences of his actions. "Thor" in this movie is played by Chris Hemsworth, while he certainly looks like the Marvel version of Thor and does a very good job of playing the part (albeit I remember even the Marvel comics version of Thor as being a bit less serious) as a scandinavian I grew up on the Peter Madsen Valhalla comic books and seeing Thor as a big, ribbed, aryan man is just a bizarre contrast to the muscled-yet-potbellied redhead Thor that I grew up with. Okay granted, the two characters were designed with very different purposes in mind and interpreted by two very different artists. It's fun to see an international interpretation of something that's been a pretty big part of my life since I was a kid - norse mythology. 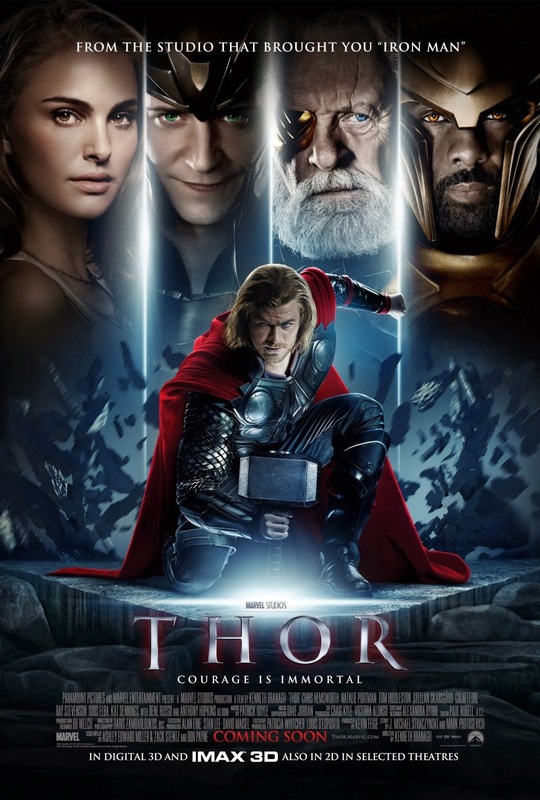 Just like in the Marvel comics, all the Asgardian residents speaks in old english, this is why it's only fitting that the movie was directed by Kenneth Branagh who's traditionally known for adapting Shakespearian plays. His biggest project being a 4 hour adaptation of the entirety of Hamlet's original screenplay. That's quite the achievement and having someone who's known for such serious work is a neat contribution to the Marvel movie line-up. It's also fitting in another regard as well, the Marvel comic book Thor is certainly named after and heavily based on norse mythology but some elements of his origin story are based on Arthurian legend. 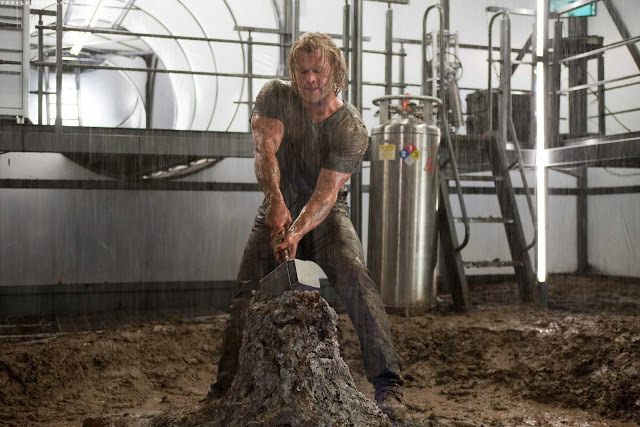 The hammer Mjolnir traditionally belongs only to Thor, however in the Marvel universe the mighty grinder can be wielded by anyone who's considered worthy enough - this is pretty much the same concept as the sword in the stone. Only the true king of Camelot could pull out the sword and be dubbed true lord of all England. We also have some Shakespearean dramatic elements in that while the story has superpowers and monsters such the story is ultimately a tale of neglect and betrayal - "a house divided cannot stand" as one would could put it. The design of Asgard in the movie are very outlandish, this is because the original Marvel design of Thor was done by Jack Kirby. Kirby was known for being able to create some very outlandish character designs, being responsible for co-creating most of the big-name Marvel comic creations such as Doctor Strange, Fantastic Four, you can certainly see his special touch in this movie. He wasn't involved in making the film, having died several years previously but the creators decided to keep the character designs and set-pieces as true to the comic book version as possible, albeit adapted a tad to make it more approachable to modern audiences. As for the actors, they all do a very good job. I'm actually thrown off by how convincingly these people can make the setting seem kinda plausible - given the circumstances of the costumes. Were anyone to nickname the Asgard segments of the movie, it would probably be "Shakespeare in silly hats". 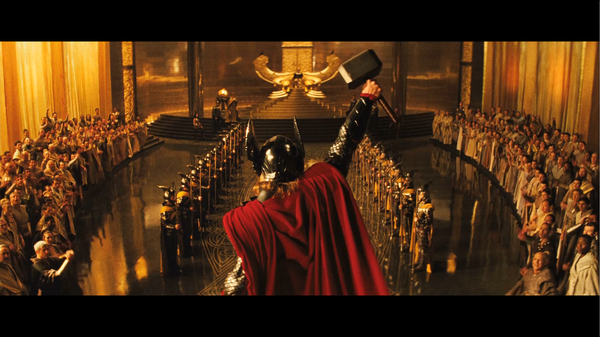 This is largely due to the talent of the Asgardian actors. While you cannot deny that the Earth based actors were certainly good (I especially liked Stellan Skarsgård as Erik Selvig) the asgardian cast just had two very good actors aboard. I'm of course talking of the star power of Anthony Hopkins combined with, the MVP of the movie, Tom Hiddleston. Tom Hiddleston portrays Loki, and really runs away with his performance. The character like the original mythic Loki in some regard but given the extra character depth of being the black sheep of his family, living in the shadow of his boastful favorited brother Thor. It's very similar to the Shakespearean character of Claudius. This comparison is obviously not lost on Kenneth Branagh and the confrontations between him and the other characters of the movie are just so well done. You can also tell that Hiddleston had a lot of fun with the character, the grin on his face when something finally goes his way is just priceless - it spells certain doom. While not as present, I also like the performance from Idris Elba as Heimdall, the guardian of Bifrost. He oozes authority and self-confidence, and really seems almost in-human in how stoic he is. This sounds like a hidden jab, but playing an almost completely emotionless character - intentionally. That is VERY hard to pull off, regardless of what anyone would tell you. That aside, I was actually able to take the costumes seriously and I'm loving the updated look of especially Loki. Keeping it true to the original but still a bit more streamlined. I also dig that they actually decided to make the movie have colors, just like the rest of the in-house Marvel movie adaptations the movie didn't attempt to make itself more serious than it is by removing most of the colors from the character designs. Compare this to the X-Men movies that removed the individual costumes from the characters and instead gave them covert-ops type uniforms to walk around in. 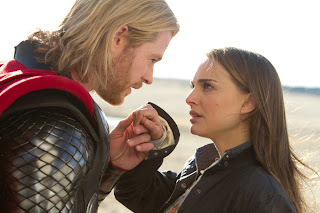 The earth sections of the movie takes place in a small desert town in New Mexico, the setting is a stark contrast to the colorful look of Asgard and really enforces the magic of the other world. You can instantly tell at any point in the movie when it is taking place on earth and when it is taking place in Asgard, this is helped by the earth sections being color-graded gray while the Asgard sections are color-graded orange/yellow. There is a third setting of the movie called Jotunheim, again contrasted to the others by being color-graded blue. However that entire setting is only present for about 15 minutes of the film combined, and is mostly set in shadows and at dusk. Frost giants, on a side note, is a horrible translation of "Jotun". Jotuns are nothing like giants. Though there are giant jotuns.. no wait, I'm getting off on a tangent here - Jotuns are not giants end of story. As far as adaptations of mythology goes, this is a very inaccurate version. However, as far as comic book adaptations go this is pretty darn accurate. It sticks to the original looks of the characters, it doesn't add unnecessary extra drama to make itself more mature and on top of all that it manages to be fun to watch while still having some pretty serious elements to it. Thor is part of the Marvel cinematic universe and would be the first one to add a mystical element to the setting. Prior movies in the continuity having been mostly based on science fiction. Tom Hiddleston would also go on to be the best Marvel movie villain thus far, a man driven to desperate measures by a neglectful family is something anyone can relate to. However much you love your family, being a family can be hard and sometimes it just drives some people over an edge they cannot come back from. The lovestory present in the movie is, while very sweet a bit out of place given the rest of the movie. It falls into typical Disney romance territory when it comes to how short it is. For the purposes of establishing it as part of the Marvel lore however, I glad they kept it in, if anything to get a heartwarming break from all the drama of the Asgardian setting. While not the greatest superhero movie ever, it certainly deserves recognition as being a good movie. A fantasy adventure with a great hero and a greater villain.